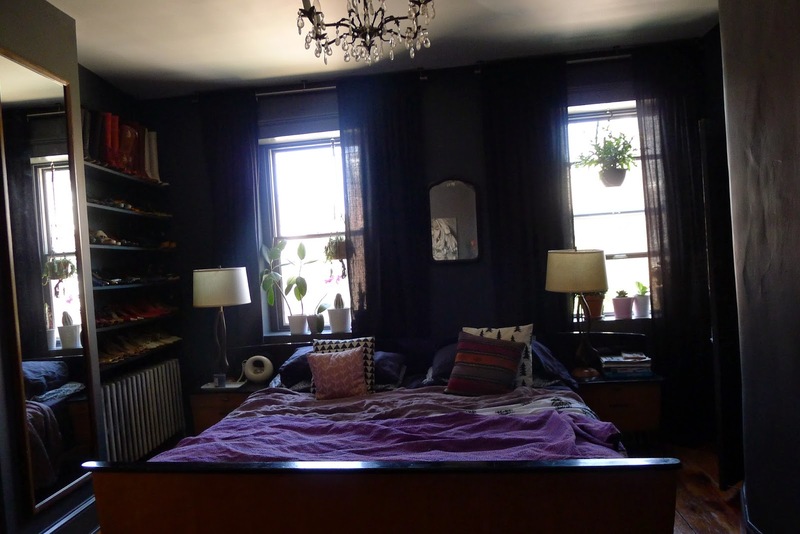 The Master Bedroom is Black! I’ve been having an unusually discontented few months. It all started when I came down with an awful cough, fever, and cold. It seemed like I couldn’t shake feeling tiered and sick. Then Jai got sick, then Kiran got sick, then Scott got sick, and then I was sick again. It was just awful because I just couldn’t take the time off to recuperate and the time I took off I spent caring for Jai and Kiran. Then things got complicated at work. Then I started feeling a little blue and I couldn’t move on like I normally do. So to make myself feel better we decided to get someone to paint a few rooms in the house. 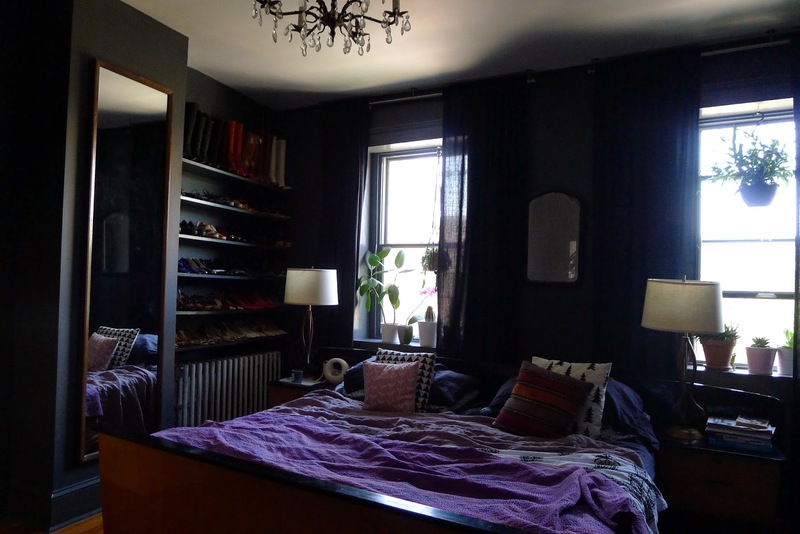 The Master Bedroom is now black….to be precise Deep Space by Benjamin Moore. Scott and I rarely get someone else to do the work in our house but this time having this room painted felt like a luxury. We also got the old wallpaper holding together the plaster ceiling removed and we had the plaster fixed and painted. 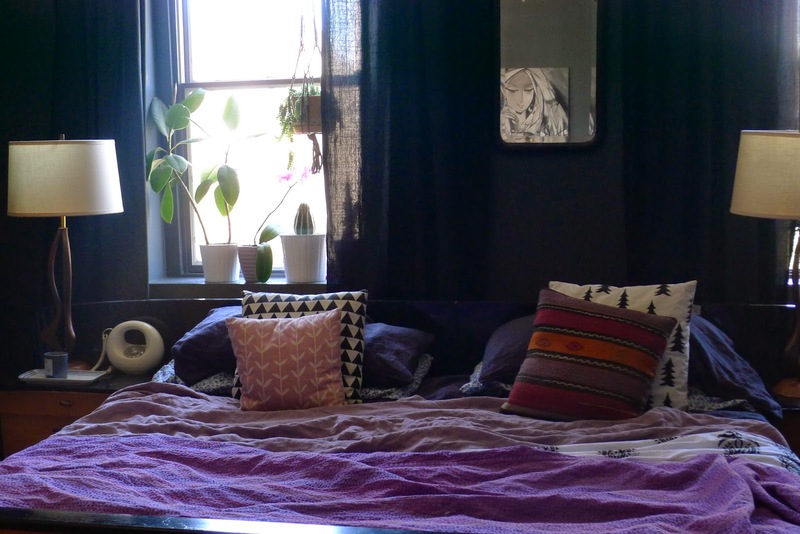 The triangle pillow cover is from etsy, the pink pillow is from SkinnyLaMinx (via etsy), the kilim cushion cover is from eBay and the other black and white pillow in their Gran design from Fine Little day. 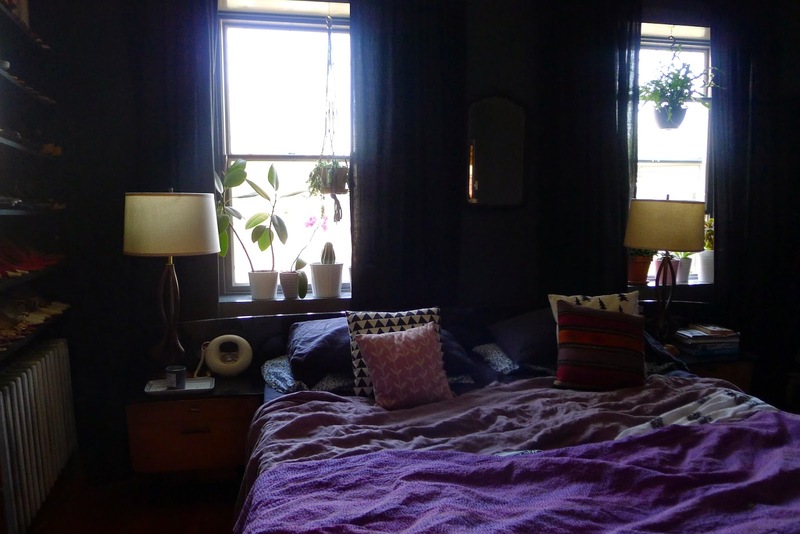 The dark linen sheets are from Crate and Barell, light pink garment dyed linen sheet is from Restoration Hardware and the purple bedspread is a vintage Kantha quilt. Both mirrors are vintage, the lamps are vintage teak lamps found at a flea market with new shades from Restoration Hardware. We just hung these inexpensive cotton curtains from Ikea. They filter the light beautifully when they are opened a little. At night when closed they completely block out all the street lights. The picture above shows my favorite feature in this room….the curved plaster wall. I love how it looks painted in this rich color. It almost feels like this room was meant to be painted in dark. To blur the boundaries we had the shelves, molding, and doors painted in the same color but in high gloss. This room faces North-West and is generally flooded with light. My hope is to fill the window sill with plants and also to hang as many plants as possible on the window to create our little jungle in this room. Greenery looks fabulous against dark walls. Is this room done? No! I would like to get the radiator sandblasted and powder-coated in a deep purple color. Then I would like to build a wall of closets on the wall opposite the bed. I think I will use Ikea Pax wardrobes but paint them the same color as the walls. P.S. Dear readers I see that there is a lot of traffic to this website. I would love to hear your opinions. Hi! I think your room looks SOOOO great in black. 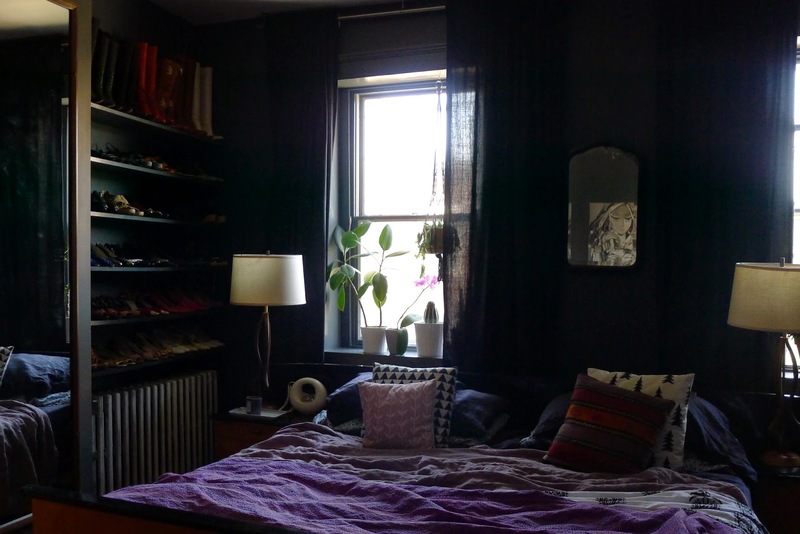 I am considering painting a darker room of my house black (ish). Have you tired of it since the summer or are you still happy? It looks very luxurious. Thank you for your comment. I am still in love with the dark walls. It is my favorite room in the house. The room looks great during the day and the night. I think that painting all the molding out in the same color as the walls makes a huge difference. Good luck! Hi Roz! Great to see you here.